Retelling (Baz Goyi) A collection of twelve short stories in the characteristic style of the author creatively employs mythological symbols to manifest collective consciousness. 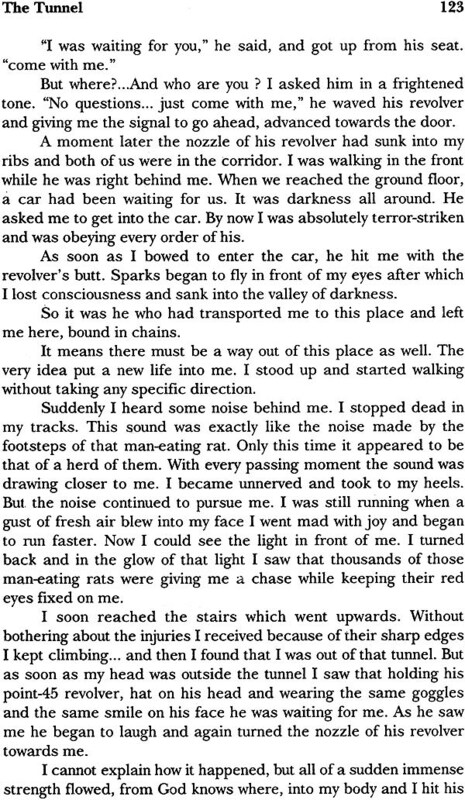 Concealed in this story are many lessons for the most modem fiction writers today. The art of Surendra Prakash can be seen scaling dizzy heights in this work. Sri Surendra Prakash (b. 1930) born at Lyallpur, now in Pakistan. Majority of his works are rich in those qualities of the genre which throw light on the explored levels of mind and sensibility. He writes a uniquely beautiful prose. His prose has mysterious dexterity, poem-like subtlety, and like poetry it is hard to decide whether irony or melancholy is dominant in his style. There was a time when Surendra Prakash’s name needed introduction and his stories needed explication. Today his work is seen as setting the seal of quality on the fiction being produced in the sub-continent. Sri Avtar Singh Judge, (b. 1929), translator of the present collection is a journalist by profession. He has been translating fiction from Punjabi and Urdu into English and publishing it in various magazines. His translations have been included in many anthologies like Uttara, a literary digest of North Indian languages published by Sahitya Akademi and Break Through, a collection of Hindi and Urdu short stories published by Indian Institute of Advanced Studies, Shimla. There was a time when Surendra Prakash’s name needed introduction and his stories needed explication. Today his work is seen as setting the seal of quality on the fiction being produced in the sub-continent. There is no shortage of people who are desirous of carrying the load of critical appreciation and also of showing the way to the new short story of urdu on their delicate shoulders. But they do not know what are the basics of story writing. They do not know how and in what way the fiction has changed after Manto and what are the special features which give a distinctive position to the new story as compared to the old one? Because it is just not a matter of plot and characterisation of abstract and concrete, of social meaning and political understanding. As long as it is not fully understood what are the things from which the modern short- story writer has broken away and why, till then the critical appreciation of new short story is not possible. 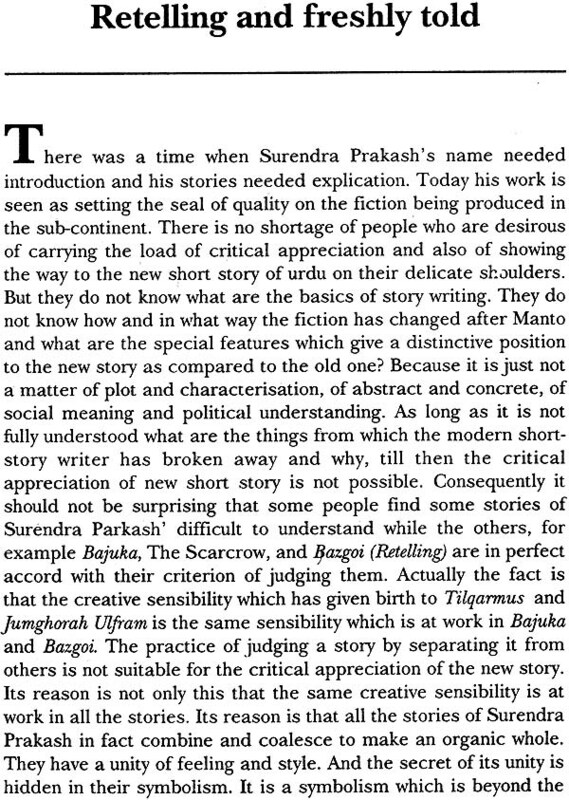 Consequently it should not be surprising that some people find some stories of Surendra Parkash’ difficult to understand while the others, for example Bajuka, The Scarcrow, and Ijazgoi (Retelling) are in perfect accord with their criterion of judging them. Actually the fact is that the creative sensibility which has given birth to Tilqarmus and Jumghorah Ulfram is the same sensibility which is at work in Bajuka and Bazgoi. The practice of judging a story by separating it from others is not suitable for the critical appreciation of the new story. Its reason is not only this that the same creative sensibility is at work in all the stories. Its reason is that all the stories of Surendra Prakash in fact combine and coalesce to make an organic whole. They have a unity of feeling and style. And the secret of its unity is hidden in their symbolism. It is a symbolism which is beyond the logic of mimesis; the symbols do not so much work in time as in space. Surendra Prakash writes a uniquely beautiful prose. His prose does not have conscious crafted tension which characterizes Anwar Sajjad’s prose.. Nor does it have the deceptively easy and relaxed conversational rhythm which distinguishes Intizar Hussain. Surendra Parkash’s prose has mysterious dexterity, a poem-like subtlety, and like poetry it is hard to decide whether irony or melancholy is dominant in his style. And if it is irony, then who is its target? The narrator or the author himself or the reader/listener or the shadow figures who flit through the stories with muted steps, silently, as if the whole world were silent and the very silence were a part of their being? It has been said about Emile Bronte that she describes even death with such lightness of touch as if a door has shut soundlessly. In the stories of Surendra Prakash violence and terror are narrated in the same quiet, almost understated way. For he keeps both his feelings and his prose under rigorous control. His latest story Bhola’s Return, which unfortunately has not been included in this collection is its best example. 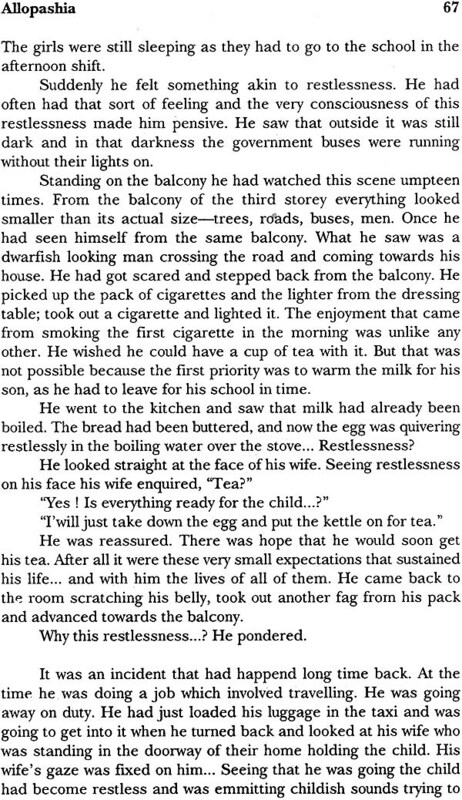 Look at this passage from Bazgoi. Most of the men, women and children raining down stones at them were crying ... While throwing the stones their hands shook uncontrollably. Whenever anyone’s stone missed the criminals the whiplashes in the hands of the soldiers descended on his body with a thrumming noise and he resumed gathering stones in a hurry. While picking up the stones sometimes, by chance, he came very close to the criminals and looked at them with frightened eyes. 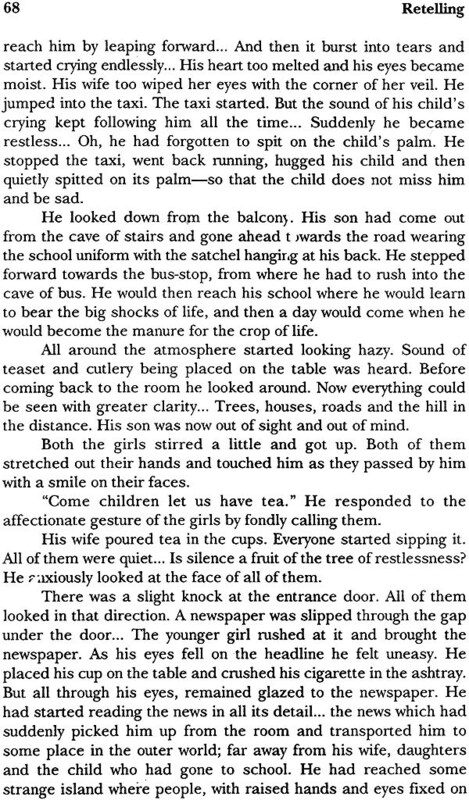 Contrary to his expectation, what he saw in their eyes, was not terror but an angelic compassion. 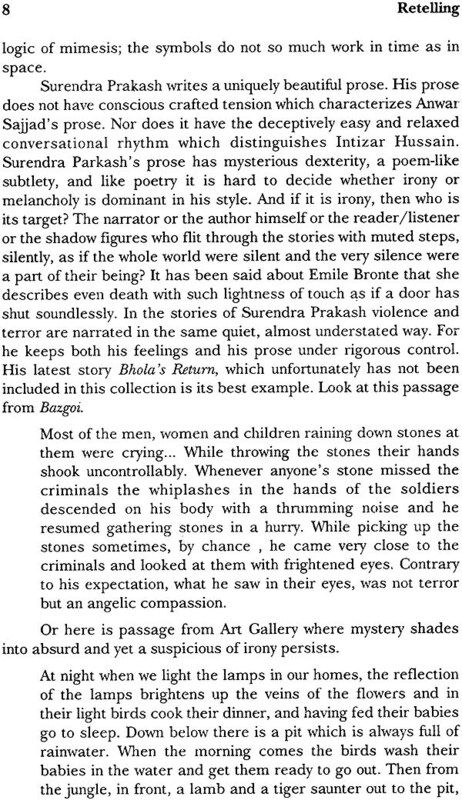 Or here is passage from Art Gallery where mystery shades into absurd and yet a suspicious of irony persists. At night when we light the lamps in our homes, the reflection of the lamps brightens up the veins of the flowers and in their light birds cook their dinner, and having fed their babies go to sleep. Down below there is a pit which is always full of rainwater. When the morning comes the birds wash their babies in the water and get them ready to go out. Then from the jungle, in front, a lamb and a tiger saunter out to the pit, drink water from the same edge, look at their reflection in the water, shake hands and go back towards the jungle smiling. Surendra Prakashs earlier stories had an apparently heavy air of mystery and some people found it difficult to understand, what was the mystery, behind the mystery? That is why, a long time back, I compared Surendra Prakash’s symbols with the characteristics of a dream, as they are beyond the logic of mimesis and point to another universe. That was the time when Surendra Prakash tried to conceal his own reaction to his own vexation and the misery of the world behind the mask of absurdity. In the later stories tiny little holes were made in that mask. Despite all his outward non-seriousness Surendra Prakash is highly creative short- story writer with highly integrated artistic sensibilities. Consequently I am convinced that these holes have been made by himself in order to make it easier for the people of lesser understanding. Possibly, it could be a good thing or a bad thing. I would rather reserve my opinion about it, because I, myself, am not yet clear about the full impact of this methodology. The chances are that when such stories come before my eyes in a fairly large number, it could be found out whether a need for making those holes was there or not. But at this time the one benefit that they have provided is that they have made the task of the reader-who neither has the spirit nor the persistence to go on with it-much easier. And I have come to know that occasionally Surendra Prakash’s vexation overpowers his temperament and he begins to speak freely. But this too is true when Surendra Prakash combines human tragedy with human emotions, then wearing his mysterious mask he leaves the readers in a state of suspense astonishment and terror, and creates a story which is called mythopoeic in the full sense of the term. In the field of mythopoeic story Surendra Prakash has established his superiority over everyone. To write a story about terrorism bloodshed is as difficult as writing about riots in 1947. 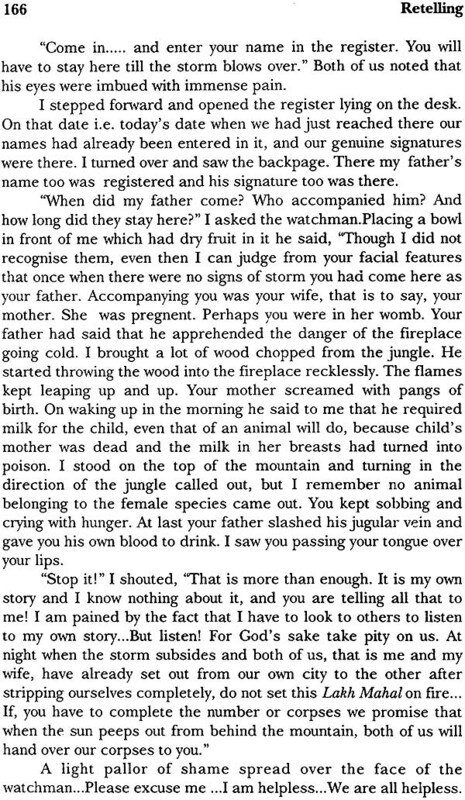 If by writing Lajwanti Bedi presented all Indian women in a mythopocic mould, Surendra Prakash, by rewriting Bedi’s story Bhola presented before us the mythography of universal human tragedy. In Surendra Prakash’ s story neither Bhola nor his uncle succeed in finding each other. Maternal uncle is killed by the terrorists and yet there is strange identity between the terrorist and victim.